Since my last post about why I love Target, several things have changed about how they offer savings. What has not changed, though, is that if you plan ahead, you can save a lot of money on each shopping trip! — Before you go, look at their sales flyer. We get the Sunday paper, but you can also check it out online here. Last week, by checking the flyer I found several offers of free gift cards I could earn with various purchases for things we already buy there! I earned $20 back on my trip this past Sunday. — Check the Target app for Cartwheel deals and coupons. It used to be that you could print coupons from the Target website and there was a separate app for Cartwheel discounts. But now, it is all in one. In the Target app (available for iOS and Android), you can select coupons and then you just show the barcode to the cashier at the register. There are separate barcodes for special coupons as well. Be aware, though, that some of the coupons on the app are manufacturer’s coupons, so you cannot use them with another printed coupon for the same item. — Print or cut manufacturer’s coupons before you go. We get the Sunday paper, but you can also print coupons at Coupons.com and Swagbucks coupons. We don’t use a lot of name brand products, but when you do, why not see if there is a coupon available! – Check post-holiday sales! Even if you do not celebrate the most recent holiday, there are always good deals to be found! This week we found all of these treats and baked goods for $7.10 total! Check out my posts “Post-Christmas shopping success” and “Post-holiday sales haul for Spring 2017”“ to see other deals we have scored! — Look in the Dollar Spot. Now, I am aware that shopping in the Dollar Spot can cause you to buy things you had not planned on buying or go over budget on your shopping trip. However, sometimes there are great deals to find! 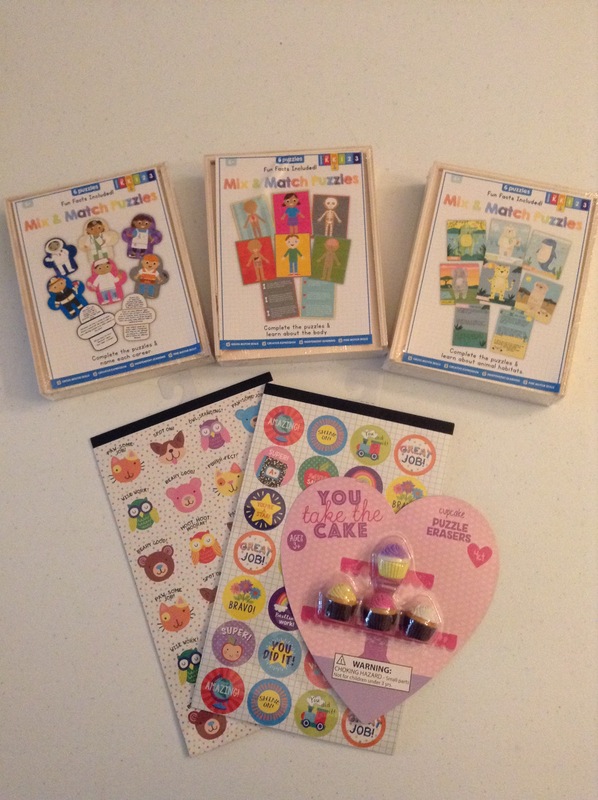 This week I found stickers ($1 for each set) for grading, erasers ($1) to give as prizes to my students, and three wooden puzzles ($3 each) for my preK classroom! — Use your Target RedCard. Some people may think that the RedCard is a credit card, but you can actually choose a credit or debit card wth this program. You save 5% everyday in store or online and get free 2-day shipping on hundreds of thousands of items! What an easy way to save! Sign up in store or online. — Lastly, after you shop be sure to scan your receipts on Ibotta and Fetch Rewards. These are my two favorite reward apps. Post to come on these soon! How do you save the most at Target? Please comment below!